Peter Paul Rubens (1577–1640), The Death of Achilles (c 1630-35), oil on canvas, 107.1 x 109.2 cm, The Courtauld Gallery, London. Wikimedia Commons. As Ovid reaches the end of Book 12 of his Metamorphoses, Nestor is still telling stories to the feast in honour of Achilles’ victory over Cycnus in the Trojan War. He has just completed the long story of the battle between the Lapiths and the Centaurs. Tlepolemus, the son of Hercules (Heracles), is offended that Nestor has not mentioned his father in his stories, to which Nestor points out his hatred for Hercules. Nestor says that he is the only survivor out of twelve sons of Neleus, Hercules having destroyed all the others. the forked lightnings, favorite bird of Jove. he assailed and tore the face of Hercules. and hit him where the new wing joined his side. his weakened pinions could not catch the air. into the left part of my brother’s neck. Those at the feast drink more wine before retiring for the night. Ovid then jumps to the closing months of the Trojan War, writing that Neptune’s hatred of Achilles has not gone away. Seeing that the Greeks are about to conquer the city, Neptune speaks with Apollo, seeking a way to kill Achilles at last. As Neptune cannot face him in combat, Apollo agrees to use his skills as an archer to bring about the warrior’s death. Apollo goes down to the walls of Troy, where he finds Paris (Alexander), whose abduction of Helen had started the war, shooting arrows almost at random. The god reveals himself to Paris, and offers to help him make his shots more effective by aiming them at Achilles. Achilles, first in war, lay on the pyre. The god of Fire first armed, then burned, his limbs. enough to fill the world — a great reward. Ovid closes the book with King Agamemnon’s call to his warriors to meet, to decide who should be awarded Achilles’ shield and arms, with which he opens book thirteen. The life of Achilles has been extensively painted, although relatively few artists have chosen to paint his death. Peter Paul Rubens (1577–1640), The Death of Achilles (sketch) (1630-35), oil on panel, 45.3 × 46 cm, Museum Boijmans Van Beuningen, Rotterdam, The Netherlands. Wikimedia Commons. 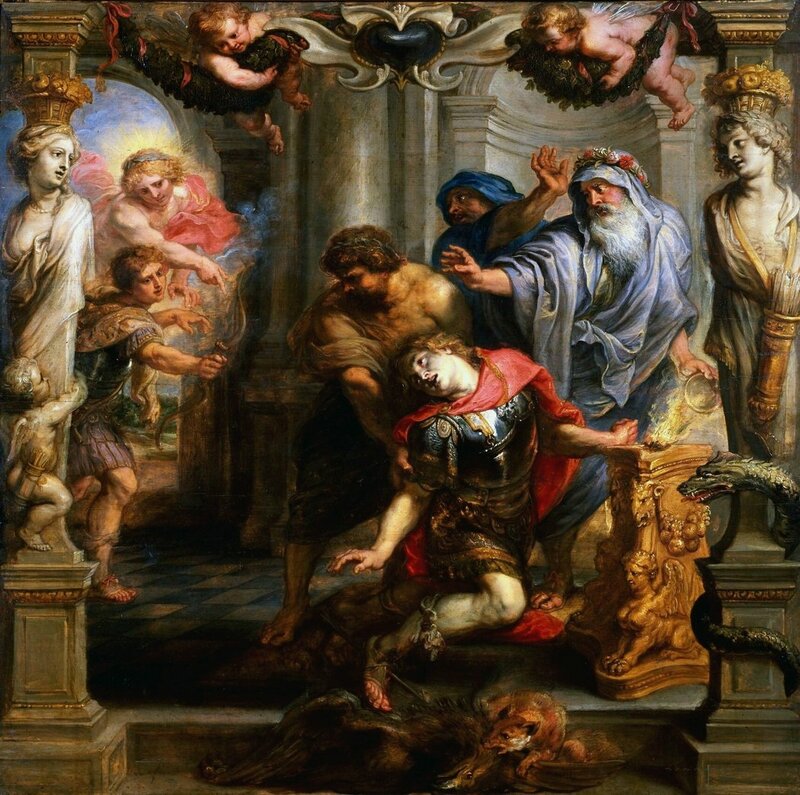 Of those who did show the death, it was Rubens who has told the story most vividly, in a series on Achilles which he painted between 1630-35, towards the end of his own career and life. This painting of The Death of Achilles is an oil sketch on a smaller panel, now in the Museum Boijmans Van Beuningen. Achilles, an arrow piercing straight through his right foot, is shown in the centre foreground, overtly moribund. But Rubens doesn’t place Achilles in battle, as does Ovid: he has been standing at a small altar to the goddess Diana, with her strong associations with archery. At the door to the left, Paris is still holding the bow which loosed the arrow, and behind him is Apollo aiding and abetting in the killing. Rubens’ finished painting of The Death of Achilles is now in The Courtauld Gallery in London, and adheres faithfully to the sketch. Achilles’ face is deathly white, and this brings to life the supporting detail, particularly the lioness attacking a horse at the lower edge of the canvas, symbolising Paris’s attack on Achilles. Henry Fuseli (1741–1825), Thetis Lamenting the Death of Achilles (1780), tempera on cardboard, 41.8 × 55.8 cm, The Art Institute of Chicago, Chicago, IL. Wikimedia Commons. 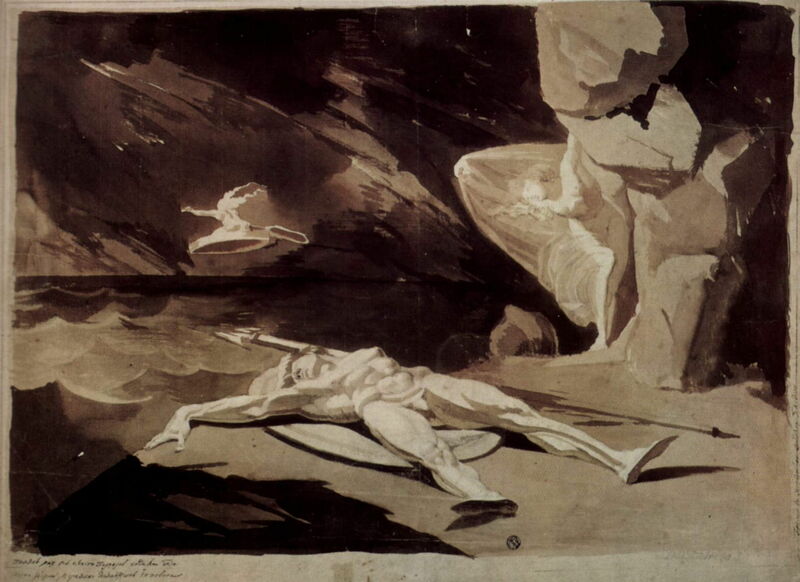 Henry Fuseli’s Thetis Lamenting the Death of Achilles (1780) is less straightforward to read. In the foreground, Achilles’ body lies like a fallen statue on his shield, his great spear by his left side. There is no sign of any wound, arrow, or injury. At the water’s edge, his mother Thetis is waving her arms in lament for her dead son. Another deity is flying past in the distance, and is seen white against the dark and funereal sea and sky. Ovid is quite non-specific as to how Achilles died, other than from an arrow shot by Paris. Since the account in his Metamorphoses, a new myth has developed, giving an account with which we are more familiar: when Achilles was a young child, his mother Thetis immersed him in the water of the river Styx, to make him invulnerable. However, she had to hold him by part of his body, the left heel, which was therefore left as his only weakness – hence, his Achilles Heel. This was first recorded in the poetry of Statius, in the first century CE. Peter Paul Rubens (1577–1640), Thetis Dipping the Infant Achilles into the River Styx (1630-35), oil on panel, 44.1 x 38.4 cm, Museum Boijmans Van Beuningen, Rotterdam, The Netherlands. Wikimedia Commons. 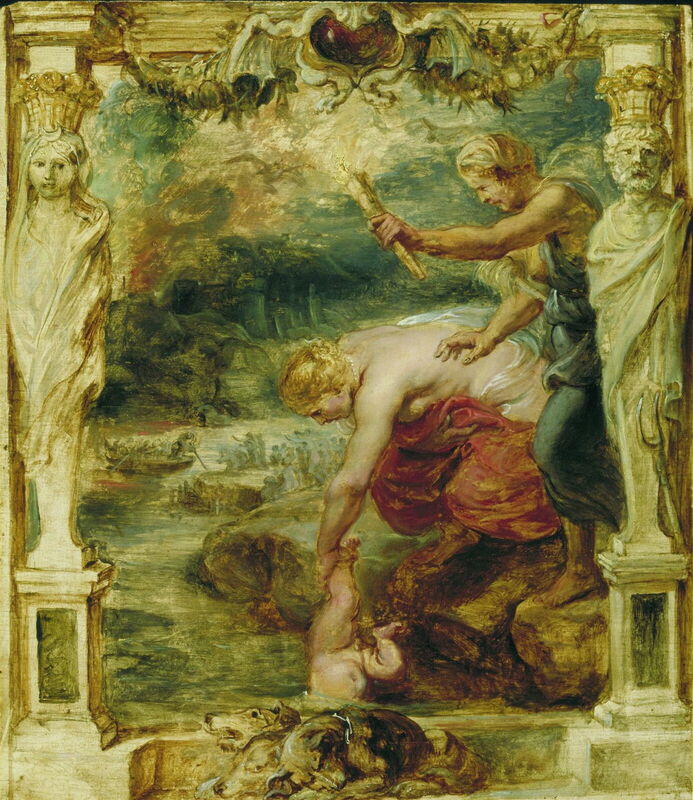 Rubens included this oil sketch in his Achilles series, showing Thetis Dipping the Infant Achilles into the River Styx (1630-35). This is seen taking place in the foreground, while in the middle distance Charon is seen ferrying the dead across the River Styx into the Underworld. 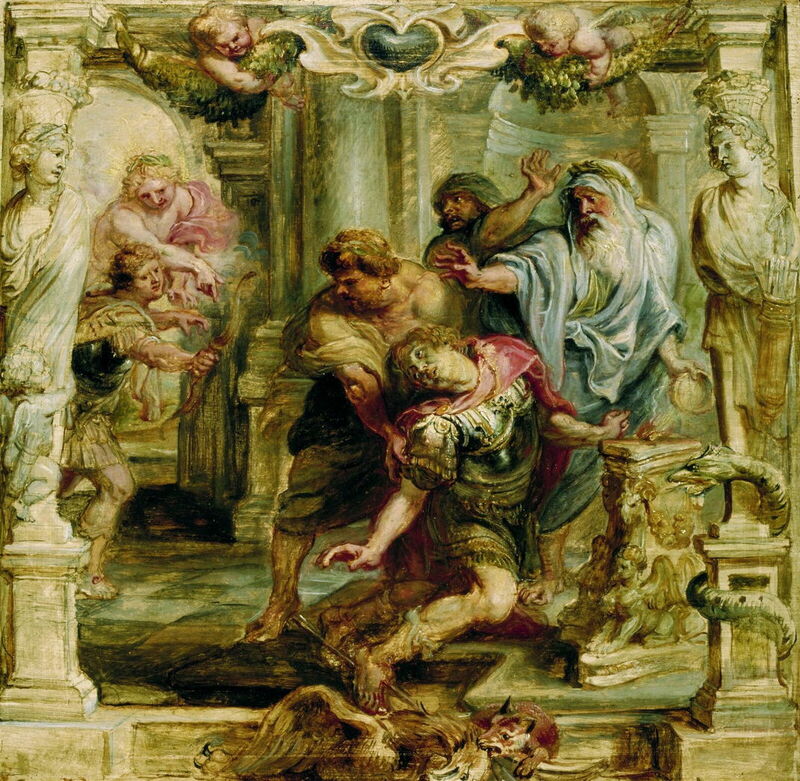 Rubens complies with Statius’ story in making Achilles’ left heel the one left vulnerable. Jan-Erasmus Quellinus (1634–1715), Thetis Dips Achilles in a Vase with Water from the Styx (1668), oil on canvas, dimensions not known, Private collection. Wikimedia Commons. Nearly thirty years after Rubens’ death, Jan-Erasmus Quellinus painted his version of Thetis Dips Achilles in a Vase with Water from the Styx (1668). 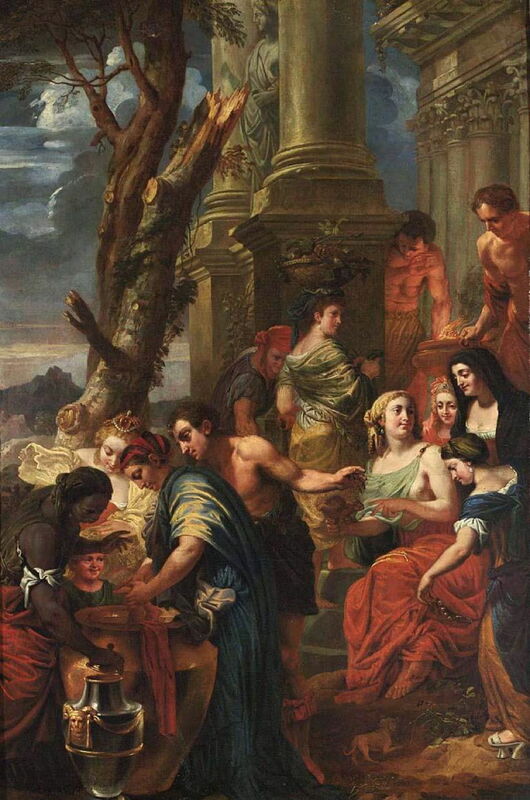 It is set not on the bank of the River Styx, but at a temple, where Achilles undergoes a baptismal procedure in a a huge pot, at the lower left. Thetis appears to be holding the infant, who is almost completely immersed, by his left foot, again in compliance with Statius. I suspect that Quellinus has engaged in a little deliberate Christianisation of this myth, which may also have made it more familiar to those who saw it, of course. 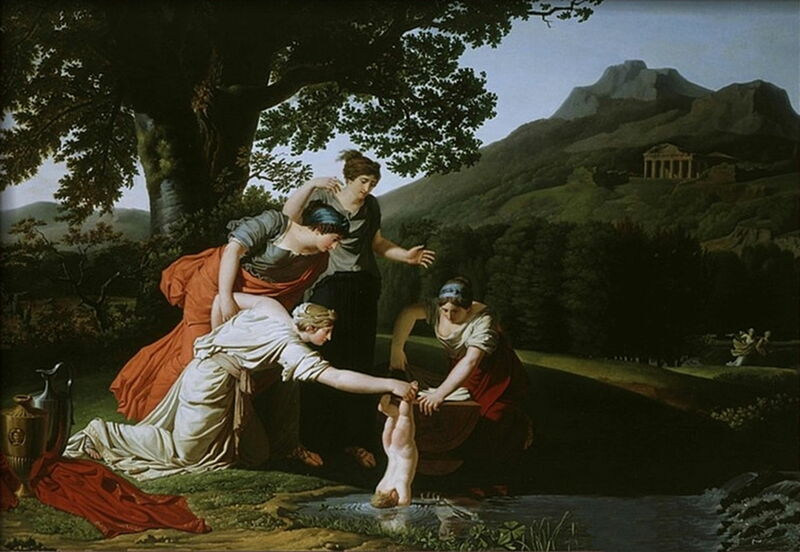 Antoine Borel (1743-1810), Thetis Immerses Her Son Achilles in Water of the River Styx (date not known), oil on canvas, dimensions and location not known. Wikimedia Commons. Antoine Borel’s more traditional account of Thetis Immerses Her Son Achilles in Water of the River Styx was painted at least a century later, in the late eighteenth century, and again has Thetis hold Achilles by his left foot. Unusually for Rubens, though, his paintings of the death of Achilles show the arrow transfixing his right foot, not the left. That was a necessity by virtue of its composition, although Rubens could just as easily have reversed his drawing to achieve consistency with this detail. In the next article, Ovid opens Book 13 with the closing stages of the Trojan War. Posted in General, Language, Life, Painting and tagged Borel, Fuseli, Metamorphoses, myth, narrative, Ovid, painting, Quellinus, Rubens. Bookmark the permalink.